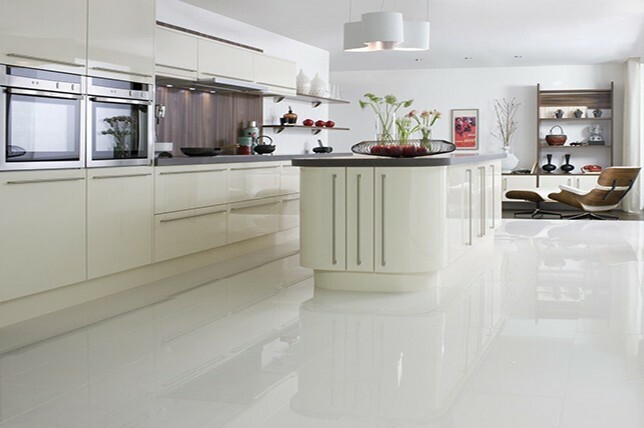 Are you on the hunt for inspiring new kitchen flooring to elevate one of your most commonly used rooms? 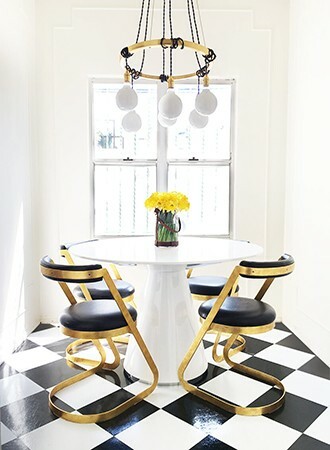 To get you on track with the best kitchen flooring options, we turned to our renovation experts for their takes on the top kitchen flooring ideas of 2019. Sustainability, warm tones, and natural materials are sure to make quite a statement throughout the year and beyond, as well as a chic throwback to the slightly 70’s retro-inspired styling that we can’t get enough of. Sustainable yet seriously chic, bamboo flooring makes for an eco-friendly alternative to synthetic and chemical ridden kitchen flooring options. Even better is the fact that bamboo trees grow at a faster rate than others, allowing them to be used to make flooring without harming the environment in a drastic way. As it’s a natural material, it’s warm underfoot and it’s warm in color too, with a beautiful grain. Especially when organic hues and natural materials are on trend at the moment, making bamboo kitchen flooring the perfect choice for those looking for something that will last a lifetime without harming the environment. Bamboo is impressively strong, making it a great material for kitchen flooring as it can withstand the everyday use and abuse that a kitchen floor is subjected too. Pros: Bamboo flooring options are inexpensive and easy to source and has a clean and contemporary look. Plus, its easy to clean. Cons: While bamboo makes for an inexpensive route to beautiful kitchen flooring, its soft surface makes it susceptible to scratches and scuffs and it tends to absorb water. And if you’re looking for a particular shade or finish, the color options are limited to just a few options. 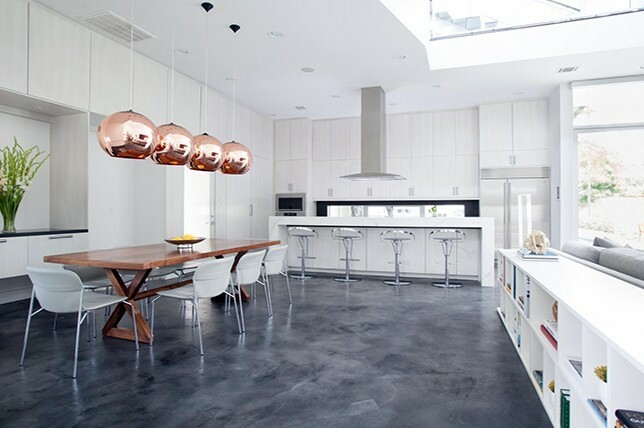 Contemporary and completely durable, concrete kitchen flooring will easily withstand the highest traffic and activity, perfect if you need kitchen flooring ideas for a busy kitchen. 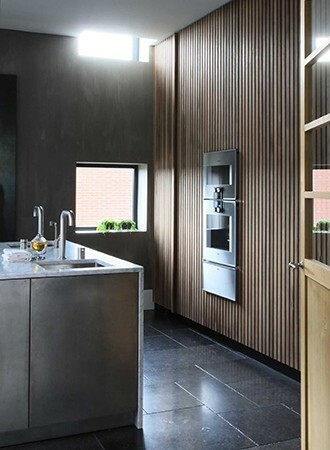 It’s flexible too; concrete can be stained, polished and waxed to give you different finishes depending on your preference and the style of your kitchen. You can use concrete flooring to give your kitchen an edgy and industrial feeling, or you can mix it up with some warm and soft colors, to alter its feel for a more comforting effect. The natural gray shades of concrete will look great against earthy tones, blush tones, pastels, and neutrals alike, plus, it looks excellent when paired with the Scandinavian and Hygge design styles that we are seeing more and more of as we head towards 2019. Pros: Since a kitchen is often one of the most heavily trafficked rooms in any home, concrete flooring is easy to clean and maintain, and is of course, ultra-durable. Even better is the fact that flooring experts have finally started to explore color plays with concrete for a more customized approach. And kitchen floors made from concrete are easier to heat. Cons: The second you hear ‘concrete kitchen flooring’ you most likely think of hard and cold surfaces, which is, unfortunately, quite true as any friction paired with concrete is most likely to end up with breaks and injuries. And when its not sealed properly, moisture and mold can be a huge problem when it comes to concrete flooring. And as you can imagine, cracks are almost inevitable as the foundation of a home shifts over time. Cork materials make for a unique kitchen flooring option as it boasts a completely different texture from any other kitchen flooring materials so easily available. It’s soft underfoot, and it’s a great heat insulator and sound barrier, making it a great choice if you are in an apartment and are conscious of making noise for your neighbors below. It’s also friendlier to the planet than man-made materials like vinyl, so if you are creating a space which is environmentally conscious, cork is an affordable and less impactful kitchen flooring material. It’s also surprisingly durable and it’s anti-microbial as well. Plus, the warm and natural tones of cork are in-keeping with the earthy color schemes that are trending at the moment. Pros: With its soft feel, cork is a great material for areas you’ll be standing in for a long while, and it’s hyper allergenic and boasts antimicrobial properties to boot. It’s also easy to install and maintain, and of course, is environmentally friendly. Cons: Due to its soft density, cork is easy to damage and stain and is prone to fading over time. For a clean and coastal vibe, white laminate makes for the perfect choice. An all-white wood-effect laminate is a great choice if you have a darker kitchen and you need to lighten up the space and make it feel larger instantly. The wood effect allows the laminate to be light in color, but without being too cold-looking. 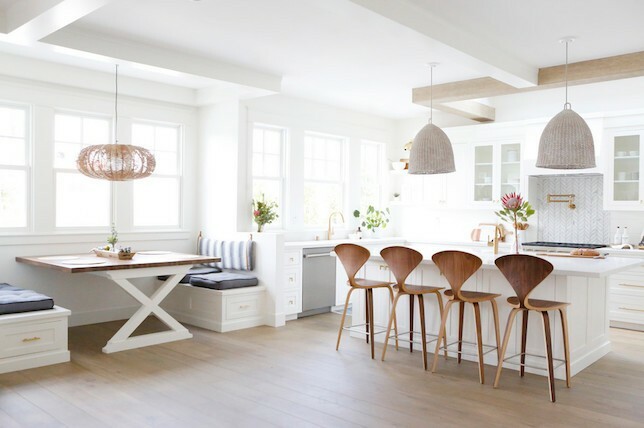 White laminate kitchen flooring will also look great when paired with the blush and earthy tones we’ve been seeing a lot of, making it a strong contender on your list of the best kitchen flooring ideas 2019. It will also look wonderful alongside the forever popular Scandinavian design style we are seeing more and more of thanks to its warm blues and grays that come alive with white flooring. Pros: Laminate flooring is inexpensive to both buy and install, and ages with a beautiful time-worn patina. It’s also quite durable and water resistant. Cons: The only downside to laminate kitchen flooring can be that it is difficult to repair when working with a large slab compared to smaller tiled options. Gray has fallen somewhat out of favor for furnishing and wall colors, but it’s still a great choice for kitchen flooring. It’s a very flexible color, meaning it will stand the test of time, tile changes and re-paints. Wood is very popular at the moment, so a wood-effect laminate is a great way to emanate that. Granted, it doesn’t have the natural patina of solid wood flooring, but it is a good option if you are on a budget. Pros: Cheap to buy and install, gray laminate kitchen flooring will also work to easily to conceal surface stains from everyday use as white flooring will only highlight every blemish. Cons: When not working with small individual tiles, repairing laminate flooring can be a dramatic and costly and procedure. When our clients consider rubber kitchen flooring they usually equate it to the feel of a gymnasium, however, there’s more to it than just that. It’s not so you can bounce around the room; it is similar in a lot of ways to cork flooring, but it is available in loads of more colors and textures, allowing you to match it with your kitchen color scheme. 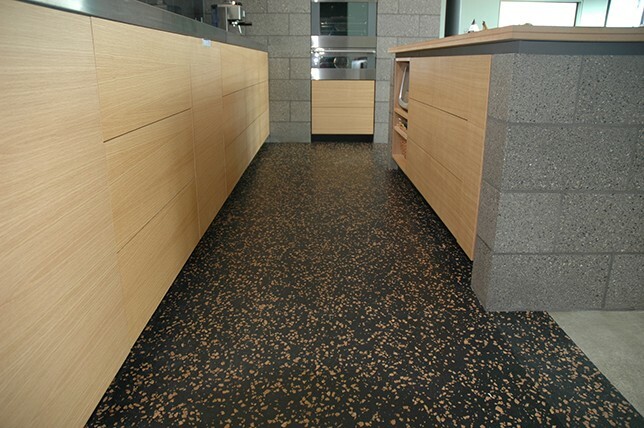 It’s durable and non-slip, and you can choose recycled rubber flooring to be more environmentally friendly. It’s easy to clean too – so if your kitchen is prone to spills (or you’re just a messy cook) this might be one of the best flooring for a kitchen, for you. Pros: Rubber kitchen flooring is easy to source, incredibly durable, and best of all, its soft underfoot for added comfort. It’s also water-resistant, inexpensive, and easily recyclable. Cons: Attractive rubber flooring styles can be expensive, can be slippery when wet, and can absorb stains from daily wear and tear. 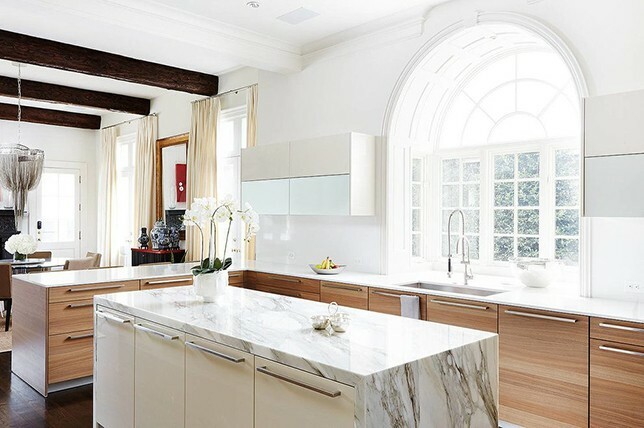 It should go without saying that natural materials are always on trend, and that said, you can’t get more natural when it comes to kitchen flooring than stone. It can be chilly underfoot, so you might want to invest in some strategically placed rugs to keep the chill off your toes, especially under the dining table (another one to add to the list of kitchen flooring ideas 2019). Natural stone is always unique and can have striking variations in pattern and color. 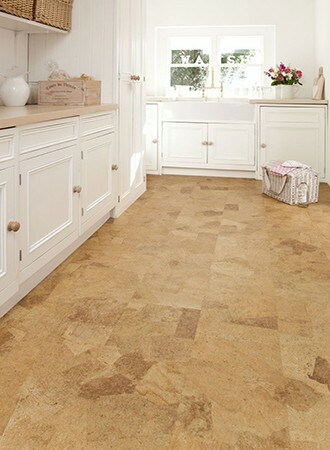 It’s earthy and it has a warm underlying tone to it, making it a great alternative to synthetic kitchen floor tiles. Pros: Natural stone flooring is beautiful and looks great when paired with just about any design style from rustic to contemporary. Its also quite durable and not as slippery as other kitchen flooring options – making it a smart material for home with children. Cons: Some stone flooring options can be expensive and prone to being brittle and porous. If wood and stone kitchen flooring aren’t for you and kitchen floor tiles aren’t your thing, then how about something a little bolder and more colorful, and more affordable? You can keep your kitchen on trend by choosing the right color vinyl to suit your color scheme. Blush tones, earthy tones, and muted pastels tones are getting more and more popular, and you can achieve these looks with water-resistant vinyl. Pros: The color possibilities are endless, making it the ultimate option when considering custom kitchen flooring. Vinyl kitchen flooring is also seriously moisture resistant, inexpensive, and is easy to install and maintain. Cons: Vinyl flooring can fade over time, is prone to damage when hosting heavy objects, and is non-biodegradable. Dark solid woods are always in style and solid wood has always been a smart choice when it comes to kitchen flooring ideas. Every piece of wood flooring is unique, meaning you will have a kitchen floor that no one else in the world has. It’s durable and long-lasting and will stand the test of time (as long as you take care of it properly), making it one of the best flooring options for kitchens. Wood can be quite expensive, but it’s worth it to achieve the luxurious and warm look that it never fails to deliver. If you are inspired by retro-inspired ’70s designs, then dark wood kitchen flooring will help you easily achieve the look of the era. 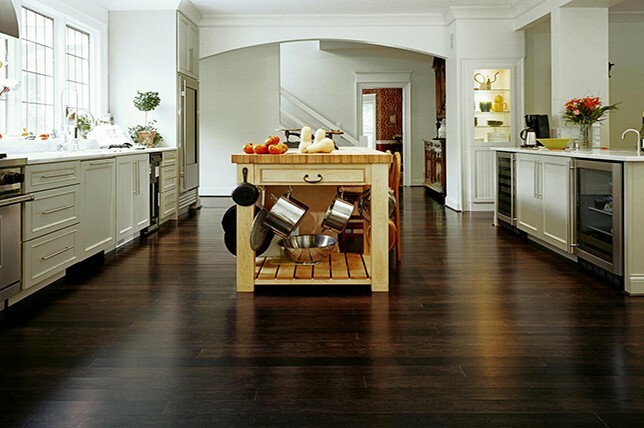 Pros: Hardwood kitchen flooring makes for a more timeless option than kitchen floor tiles and is much easier to repair. Cons: Overtime, hardwood kitchen flooring will show wear and tear in high-traffic areas. 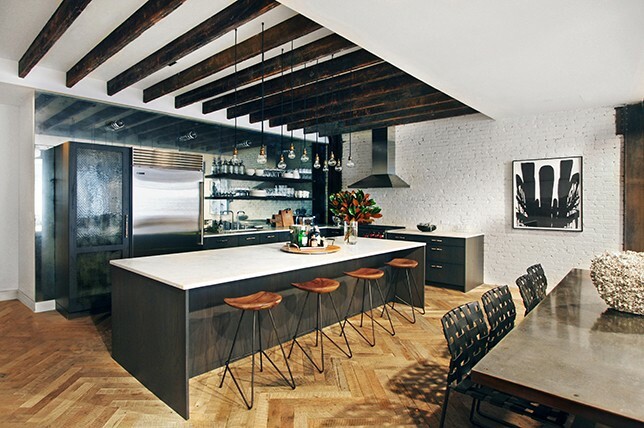 Classic herringbone pattern kitchen flooring is on trend, and for many a good reason. It’s laid in a geometric pattern, and geometry always makes for an elegantly consistent look. Patterned flooring also lends an interesting visual play in your kitchen and adds a depth of texture that you don’t get with standard flooring materials. You can use kitchen floor tiles or wood to create a herringbone pattern, mixing and matching flooring tones to create an entirely unique pattern. Kitchen tiles are a great option if you want to mix and match colors and go bold with your own kitchen floor tile design. Pros: A beautifully installed herringbone floor can add value to your home and is durable and long-lasting. Cons: Like with any wood material, it can fade and show wear over time and require frequent maintenance. You already know how popular geometric patterns are going to be in 2019, and that’s no exception when it comes to flooring. Hexagonal tiles were one of our favorite trends to come out of 2018 and we are looking forward to taking them with us into 2019. Contrast white kitchen floor tiles with dark grout or mix and match colors to create an interesting pattern. How about choosing a pastel palette for your kitchen tiles? This will look great with a grey and otherwise simply styled kitchen. 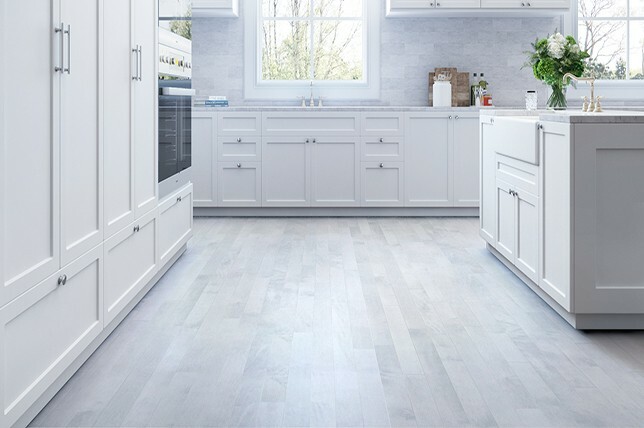 Pros: The take on modern kitchen flooring boasts endless design and color options, is durable, water and stain-resistant, and is easy to care for. Cons: Tiled floors can be cold and hard to walk on, and can be costly to have expertly installed. 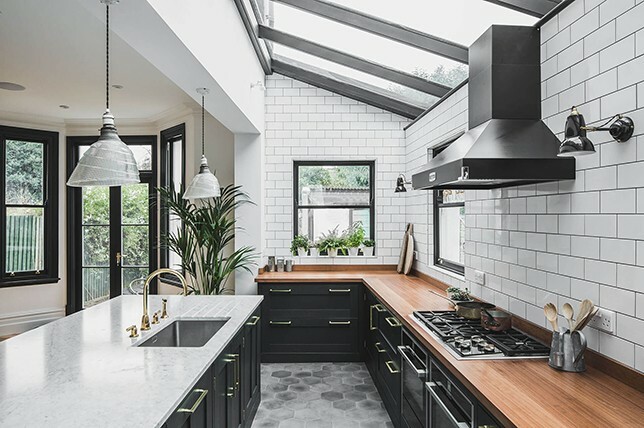 Checked kitchen tiles may seem like they are a throwback to popular kitchen flooring of the past, but there’s nothing wrong with timeless interior design standards. 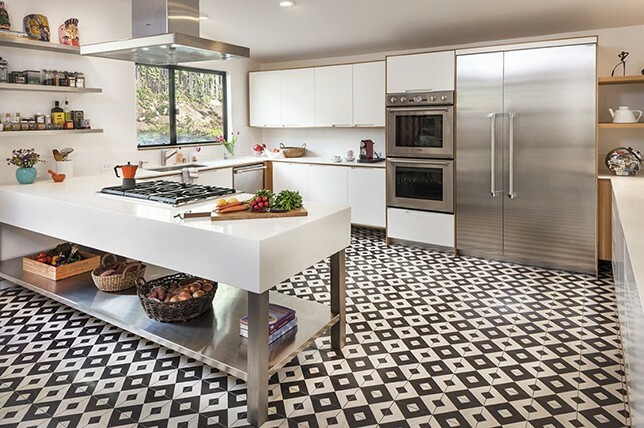 Retro-inspired kitchens are on trend and how much more retro can you can get than checkered tiles? They are a more visually interesting alternative than your traditional wood kitchen flooring options and you can turn up the retro styling with ’70s styled Mid-Century Modern kitchen cabinetry and some of those classic’ 70s colors and patterns that we are loving at the moment. Pros: Timeless style, affordable, and easy to maintain. Cons: You could very well run the risk of tiring easily from its graphic appeal.